Dr. James Waller, Director of Academic Programs for the Auschwitz Institute for Peace and Reconciliation (AIPR), delivered the keynote address at the 2016 Fort Leavenworth Ethics Symposium at the Command and General Staff College in Fort Leavenworth, Kansas. The Symposium, which began in 2009, is an annual event co-sponsored by the host, the U.S. Army Command and General Staff College (CGSC) and the Command and General Staff College Foundation. This year’s iteration was titled “The Ethics of Humanitarian Military Operations and Intervention” and included remarks by guest speakers in addition to both panel and general discussions. 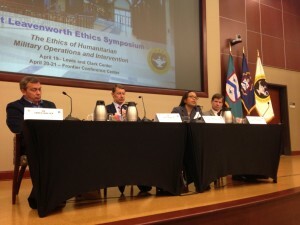 The objective of the Symposium was to explore the ethical implications of committing the military to non-traditional roles, as many have come to view the US Military as “the nation’s ‘Swiss Army Knife”, that is to say, an organization rich in talent and capability that is able to project itself across the world in order to solve diverse challenges. The keynote address, delivered by Dr. Waller to an audience of over 1,400 military personnel from around the world, was entitled “Confronting Evil: Engaging Our Responsibility to Prevent Genocide”. Following a break for lunch, the event reconvened for an afternoon discussion that saw Dr. Waller participating in a panel with Yvette Bourcicot, an alumna of AIPR’s 2015 Raphael Lemkin Seminar and Senior Advisor for Atrocity Prevention and Response for the Office of the Secretary of Defense (Policy), as well as Colonel (Ret.) Dwight Raymond, a Peace Operations Specialist at the Peacekeeping and Stability Operations Institute at the U.S. Army War College, and former Senior Advisor to the United States Ambassador-at-Large for War Crimes Issues and professor at Vanderbilt University’s Law School, Michael A. Newton. The event program from the 2016 Ethnics Symposium is available here. To learn more about AIPR’s programs in the United States, please visit our US Programs page.